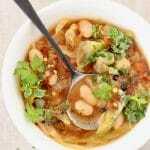 The best vegan pinto bean soup recipe from scratch. Naturally thick and creamy without the addition of any thickeners, with deep layers of smoky flavors from Mexican seasonings, smoked paprika, bay and thyme. Serve over brown rice or wipe your bowls clean with a chunk of this crusty bread. A one pot wonder that can be whatever you want it to be. Just add more water for a thinner, soup-like consistency and adjust seasonings with sea salt. Literally just throw everything inside a heavy bottom stock pot and simmer away for a couple of hours. 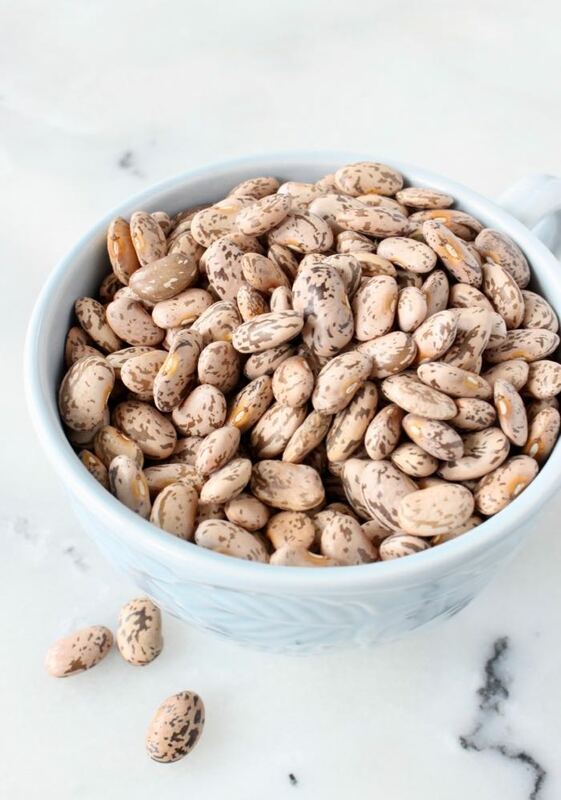 To make sure your pinto beans will soften and become buttery, wait to add the salt in the last 10 minutes of cooking. Also, remember to soak your beans friends. Very important, no way around this If you are after creamy, buttery, melt in your mouth texture. Loaded with Antioxidants, Fiber & Plant Protein. 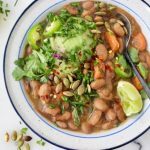 The best vegan pinto bean soup recipe from scratch. Naturally thick and creamy without the addition of any thickeners, with deep layers of smoky flavors from Mexican seasonings, smoked paprika, bay and thyme. Add the soaked and rinsed pinto beans to a large heavy bottom stock pot together with the carrots, onion, garlic cloves, bay leaves and thyme. Cover with filtered water by 3 inches and bring to a rapid boil. Turn the flame down to low and cover with a tight lid. Simmer for 1.5 hours stirring a couple of times, then add the Mexican seasonings, oregano, sweet and smoked paprika. Cover and simmer for another 30 minutes or so until the beans have softened and have a creamy texture. 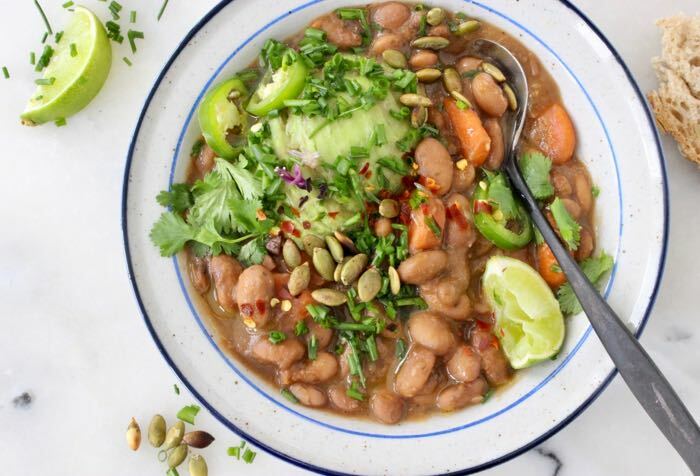 Serve with sliced avocado, lime wedges and spicy chili. 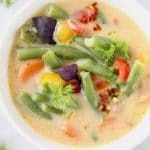 Depending on how long your beans have soaked and how old they are, you might have to add extra water during the cooking process, so adjust as needed. 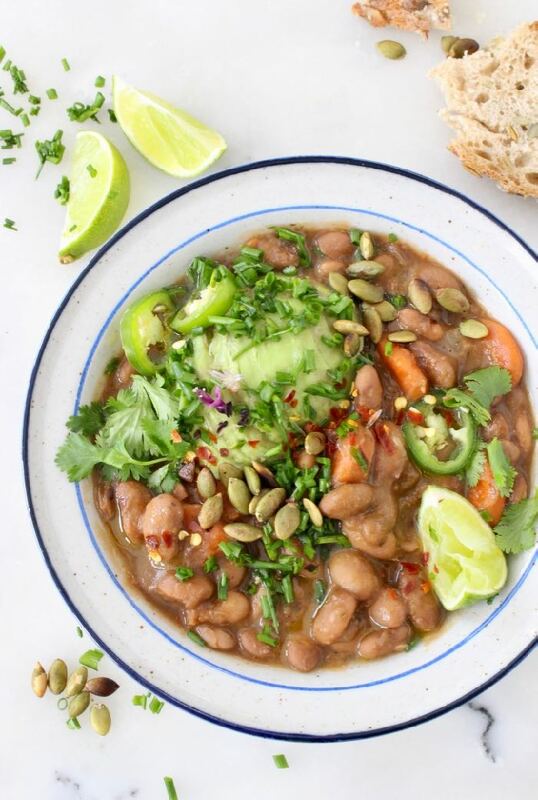 So basic, however the best beans I’ve ever made! We used them on nachos with your chunky guacamole and fresh cut up tomatoes, it was the talk of the party. Thank you, keeping my eyes peeled for your next recipes. This sounds so good! 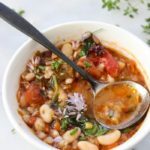 I was wondering – after soaking and draining the beans – can they sit in the fridge until ready to make the soup or will that make them too soggy? I don’t have the Mexican spice blend that you recommend. Do you know how I could make my own? I’m excited to try your soup! Absolutely! I’d cook it on low for 7-9 hours until buttery soft. Enjoy!